A fantastic update that sees Sonar both overtaking the competition and innovating in several areas. It might just be the best PC DAW of its generation. Hugely comprehensive. Sidechain support. Full version of Z3TA+ in the box! Superb step sequencer. MIDI refinements galore. V-Vocal now converts pitch to MIDI. V-Vocal still only works 'offline'. The Roland V-Vocal plug-in can now convert audio into MIDI data. The new step sequencer is a very welcome addition. The Sonitus gate plug-in is sidechain-ready. The LP-64 Multiband Compressor is as slick as they come. The MIDI Magnifier makes it easy to edit MIDI in the arrangement view. The DropZone sampler comes with 300MB of content. Sonar 7 is fit to burst with new features and plug-ins. Once the odd man out in the sequencer race, Cakewalk has fought tooth and nail to rise to the very top of the heap. Always popular in the US, the company has become one of the big names worldwide, thanks in no small part to the continued growth of their comprehensive Sonar packages. With version 7 of Sonar, Cakewalk has once again outdone itself. There are new features galore, refinements of old favourites and a few surprises. While we don't have the space to cover every single one of them at length, there are a few that'll have current users falling all over themselves to pay the upgrade fee, and we reckon that some of the updates may win over a fair few new recruits as well. It seems obvious in hindsight, but we never really noticed the absence of a dedicated step sequencer in previous versions. Why? Probably because most other DAWs don't have them either. Sure, they all let you enter a note at a time in a piano roll editor or event list, and some even enable you to tap out your notes on a MIDI controller with no regard for timing, all to be quantised lock-step by the program. However, for true grid-based pattern sequencing of notes and controller data, the best option was to look elsewhere, to an app such as FL Studio or Reason. Sonar's new dedicated Step Sequencer is poised to give those programs a run for their money. Cakewalk proclaim this to be the most innovative set of pattern sequencers ever bundled with a DAW, and we're inclined to agree (although that claim might be selling FL Studio a bit short). Step Sequencer is, on the surface, a typical grid in which rows of MIDI notes are stacked vertically, while individual steps are laid out across the horizontal axis. The notes are entered by left-clicking a step, and erased by right-clicking it, while clicking and dragging up or down on a note adjusts the velocity level. Sequences can have up to 16 steps per beat, with up to 64 beats per pattern. MIDI controller data can be drawn into a familiar controller pane at the bottom of the display. You can tie notes together and apply portamento and very funky swing. Best of all, you can easily create sequencer patterns using odd time signatures, thanks to the Fit Patterns To Quarters function, and all without screwing up the bar/beat count of your tune. This is an obvious inclusion that is all too often found to be missing from competing products. The Step Sequencer is easy to use, inspiring and loads of fun - it's great to have another way to put tunes together besides piano rolls, etc. Cakewalk has done a fine job of second guessing user needs with such niceties as compatibility with many popular preset drum maps, including those shipped with the bundled Session Drummer 2.
high the banner of MIDI. Sonar 7 numbers a multitude of new MIDI functions among its many attributes. In addition to the Step Sequencer, there are now Smart MIDI Tools on offer. These are user-configurable and designed to perform multiple functions, depending on how you have them set up. There are three pre-configured Smart MIDI Tools in the package (Select, Draw and Erase). You can determine how they react when, for example, right- or left-clicking with the mouse. You can also assign modifier keys to mouse clicks for even more options, and you can save any custom assignments you make for future use. This is all done via an interface in which you perform the actions on a 'dummy' graphic of a MIDI clip to demonstrate which mouse movement you want to associate with a function. Another new MIDI treat comes in the form of the MIDI Magnifier, which has elicited no small amount of appreciation around these parts. When working with MIDI in the arrangement view, the MIDI Magnifier zooms in on a specific section of the piano roll surrounding the mouse cursor without affecting the overall zoom level, making detailed editing from the arrangement view a real possibility. Again, this seems very obvious in retrospect, and we wouldn't be surprised if it were to become a standard feature in competitors' products. Genius! If you spend a lot of time editing MIDI Controller data in the control lanes of the Piano Roll View, you'll be happy to know that multiple MIDI parameters can now be viewed and edited using multiple lanes, if you wish. You can now copy MIDI CC data and move it across the different lanes. Not bad! Cakewalk earns kudos for the new MIDI functions, but it hasn't scrimped on the audio side either. For starters, there are a handful of awesome new plug-ins, the best of which are designed for mastering. The new LP-64 Multiband linear phase mastering compressor/limiter is a gorgeous dynamics plug-in that'll hold its own with even the most renowned third party efforts. Ditto for the LP-64 EQ, which offers both parametric and graphic modes. Both can also operate at sample rates up to 192kHz. Our favourite new plug-in is probably the relatively simple Boost 11 Peak Limiter. Bearing a striking resemblance to Sonnox's Inflator, and in the tradition of some of the most sought-after hardware limiters, Boost 11 offers just two parameters: Boost and Output. These are enough to help whip any stereo mix into perfect, CD-ready shape. Many users will applaud Cakewalk's inclusion of proper sidechaining support - a feature that users have been crying out for for some time. Sidechaining is a method by which certain parameters of an effect react to an auxiliary input signal. Electronic musicians in particular will appreciate sidechaining as a useful tool for creating rhythmic tracks from other sources. You could, say, use a hi-hat pattern to trigger a gate applied to a pad or vocal, or have the kick cause dramatic pumping effects on other parts of the mix. These effects are extremely commonplace in many forms of dance music. If you have plug-ins that enable sidechaining, you'll be able to access those functions from a mixer channel, and if you don't happen to have any spare, you'll be pleased to know that Sonar 7 comes with three sidechain-ready effects in the forms of the Sonitus:fx gate and compressor, along with the VC-64 Vintage Channel. 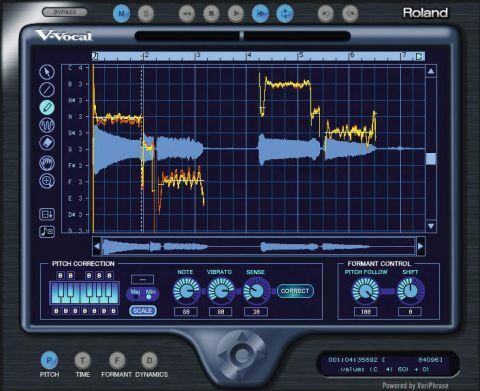 Once again, Roland's miraculous pitch manipulation tool, V-Vocal, takes the stage. This time, as version 1.5, it offers the Holy Grail of pitch-to-MIDI conversion. Don't get too excited, though, as this is a strictly offline affair. Nevertheless, with a few tweaks, we were able to create some intriguing lead and pad progressions from both vocal and guitar recordings. We should also mention that there's now full support for the integration of hardware instruments and effects, including full delay compensation for both. ACT has been expanded upon as well, with support for more devices. There's so much more to Sonar 7, but trust us when we tell you that it's improvements all round. This new version represents a logical evolution from version 6, and the company has done a good job of making a deep program easy to get around. Sonar 7 has some nifty additions, then, but what really impresses us is the way Cakewalk has refined, reorganised and subtly reworked existing aspects of the program. We did encounter a minor graphics anomaly here and there, but had no stability issues at all. Sonar remains - at least in its Producer Edition guise - perhaps the single most comprehensive Windows production suite money can buy.